How did he make those little people? I was going to go for a Wordless Wednesday and wanted to use a picture I hadn’t used yet. I looked all through our Downloads on this laptop but could not find anything I liked. Then I saw the picture I downloaded for Monstrous Monday then lost when my laptop cut out. Score! 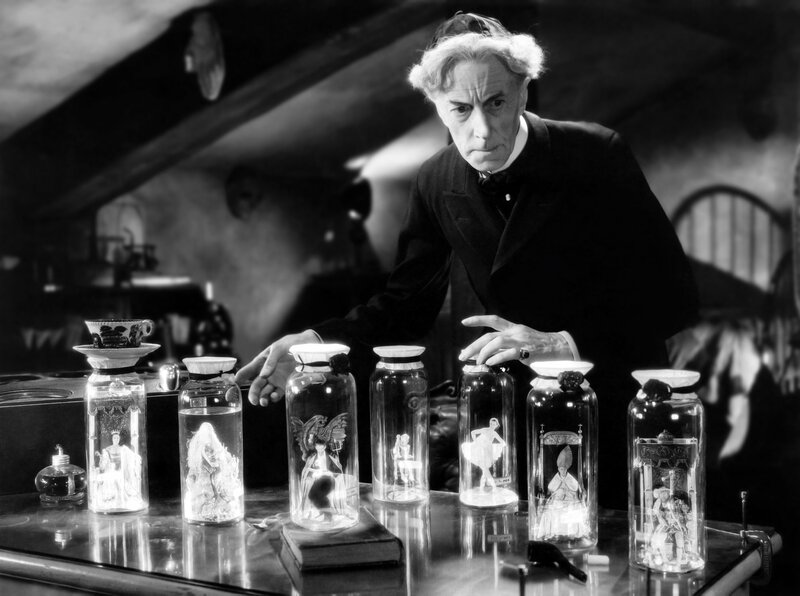 It is Ernest Thesiger as Dr. Pretorius in The Bride of Frankenstein (1935). As you may have noticed, I cannot actually have a blog post without words. I have mentioned that before. I like words. I like to talk, I like to write, even if I have nothing in particular to say. I suppose this renders me tiresome upon occasion, but, as they say, I gotta be me. If being tiresome were a crime, perhaps my Wanted poster would look something like this. This is an older picture of me, with a frame added by a theatre friend of mine. 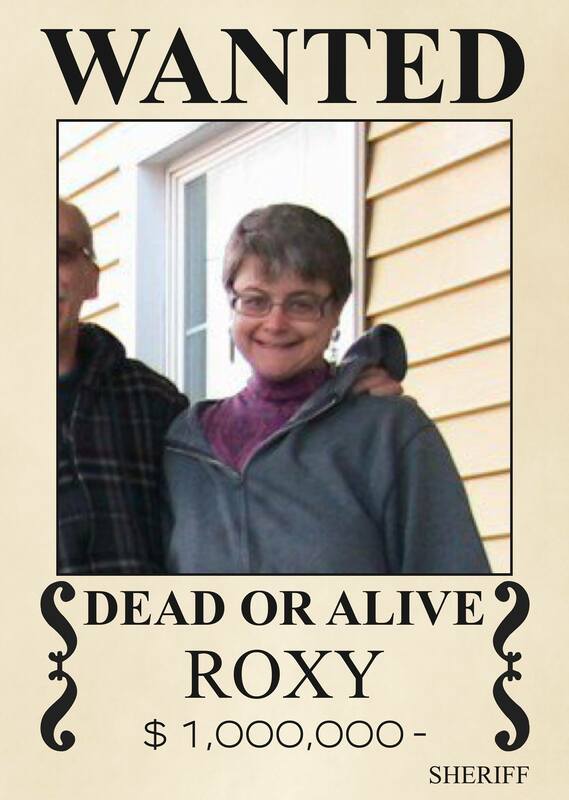 It was back in 2015, when the Herkimer County Historical Society and Ilion Little Theatre presented the play Roxy by Jack Sherman. I was honored to play the title role. This was actually a pretty entertaining flick. I decided to go to my Media Library for a third picture to round out the post. I picked this one purely for the alliteration. Look at all the W’s! 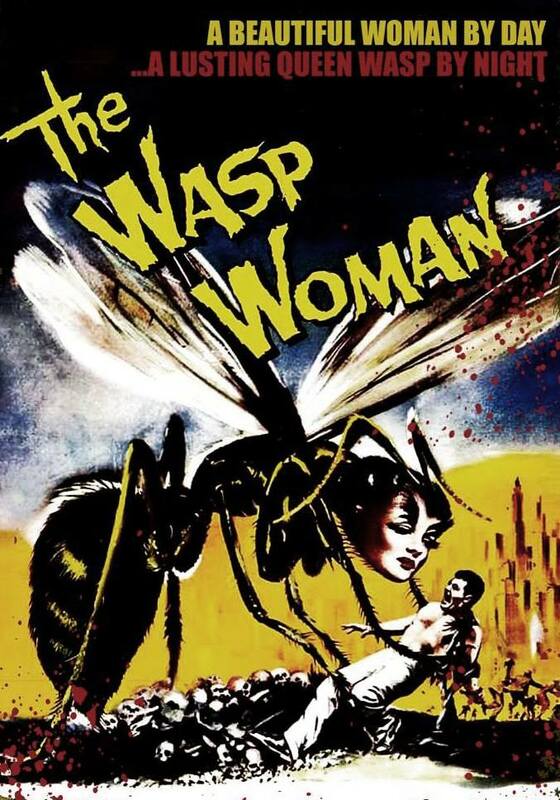 Wasp Woman on Wordless Wednesday! Or is that Wuss-out Wednesday? Maybe I should have a glass of wine. Posted in humor, personal, Wordless Wednesday, Wuss Out Wednesday and tagged blog post, blogging, Bride of Frankenstein, lame post, Monstrous Monday, not writing, pictures, Roxy, Wasp Woman, words, writing. Bookmark the permalink. A quick search tells me I already used the title “Monstrous Monday During Dateline,” so I went with something equally alliterative. I have a couple new monster pictures. I’d give him the side-eye, too. Technically, this is not a monster, except by the rule that people can be the worst monsters, but it is from a monster movie, The Bride of Frankenstein (1935). 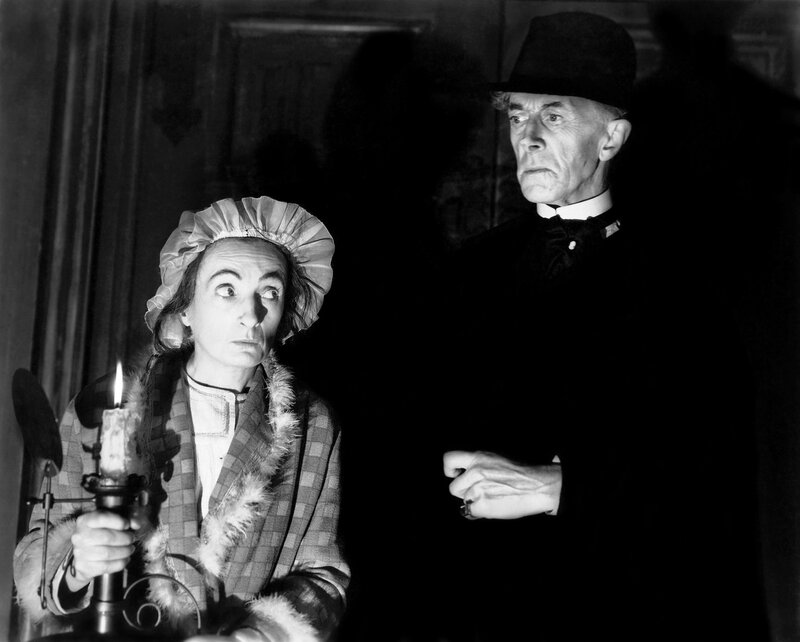 The delightful Una O’Connor looks askance at Ernest Thesiger as Dr. Pretorius, who is about to become a very bad influence on Henry Frankenstein. I’ve had worse first dates. Full disclosure: This is not the other new picture I had planned to use. My stupid laptop cut out on me as I was typing the previous paragraph and when I got it back up, the picture was gone. I’m sure it is still around here somewhere, but I cannot be bothered to look for it on a Monday. For one thing, I have Dateline to watch (see title). I admit once again, I am not good for much of anything on a Monday. I’m not so hot other days of the week either, but I can’t worry about those days now. I think the best I can manage right now is to throw in a couple more pictures, hit Publish, and hope for the best. I hope you are all having a delightful Monday. He looks the way I feel right about now. I thought a nice close-up of Frankenstein’s monster would be appropriate. 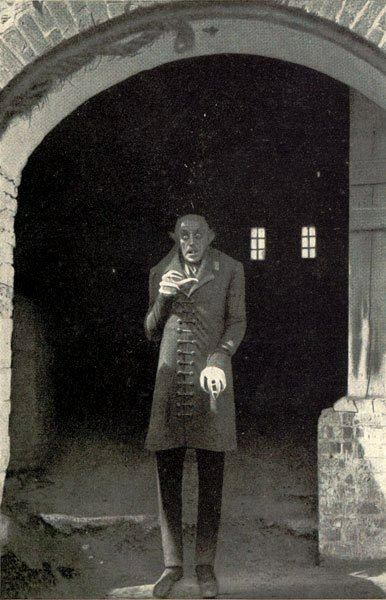 And I close with Nosferatu, just because. 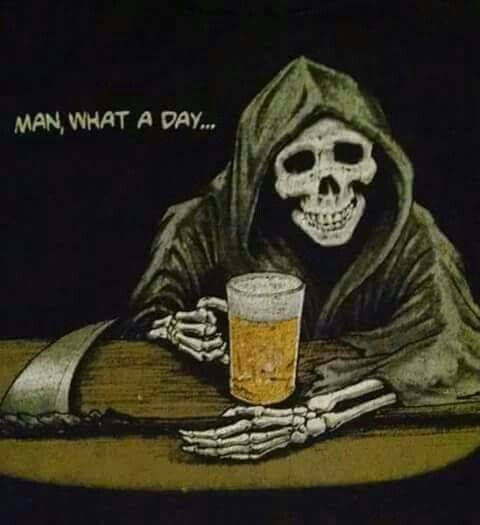 Posted in humor, Monstrous Monday, personal and tagged blog post, blogging, Bride of Frankenstein, Dateline, Frankenstein, Frankenstein's monster, lame post, not writing. Bookmark the permalink. He looks kind of like I feel. Hello, it’s Monstrous Monday. I am dreadfully tired. Did I work too hard today? Did I play too hard all weekend? Does it really matter? I say no, it does not. What matter is that I make some semblance of a blog post before I sleep. He does not look as if he is bidding us velcome. Well, that didn’t work. I was just looking for a Christmasy picture in our downloads, since Thanksgiving is over and so Christmas can begin. Instead, I saw this lovely shot of Bela Lugosi that I don’t think I have used before. Well, who doesn’t love a vampire for Christmas? 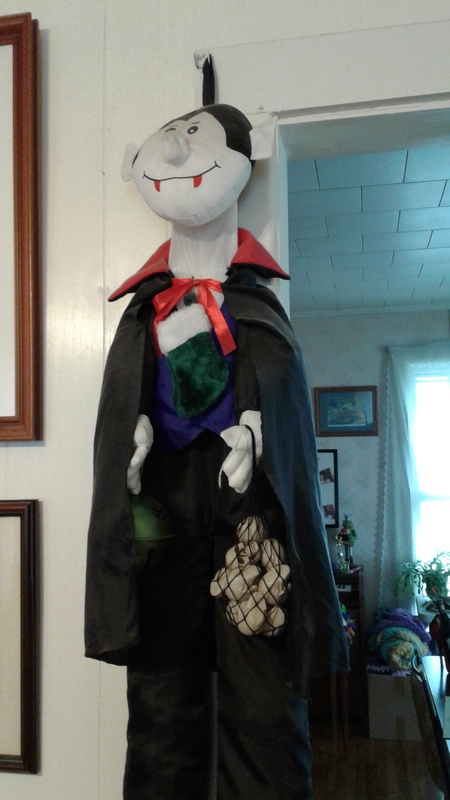 This vampire is hanging in my living room. My nice husband Steven gave him to me for Christmas several years ago. Please note the green stocking hanging around his neck. You can also just about see the green jingle bell in his right hand. We often mix holidays in our house. Oh dear, as I was looking through my Media Library, I saw that I did have that picture of Lugosi. Well, I can’t remember every picture of Bela Lugosi in my collection. It is unreasonable to expect it. I don’t really look anything like this, but the words fit. I close with the picture that reminds us: I’m not perfect, and I can’t even pretend to be close. On the other hand, I have made some semblance of a blog post. I’ll try for a better one tomorrow. 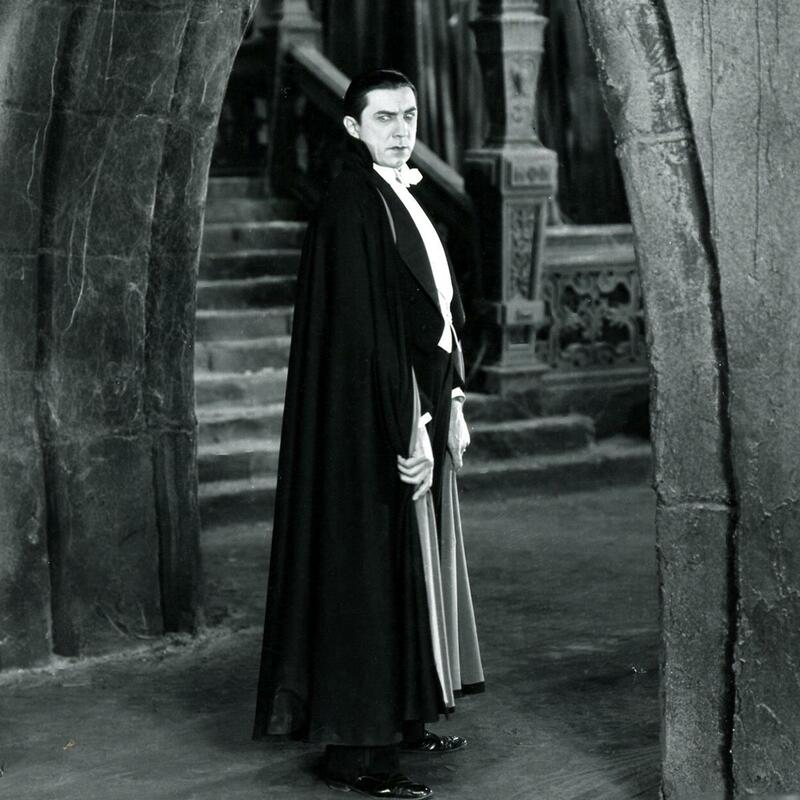 Posted in humor, Monstrous Monday, personal and tagged Bela Lugosi, blog post, blogging, Bride of Frankenstein, Christmas, Dracula, Frankenstein, monsters, tired. Bookmark the permalink. It has been a lovely Thanksgiving holiday and birthday for me. Yes, my birthday fell on Thanksgiving this year, and every year it is the day John F. Kennedy was shot. Today I am 55, speed limit year, as a friend of mine said, or as I like to say, I have two nickels to rub together. Did you hope I had something profound and meaningful to say about the day or my age? How long have you been reading this blog? I think a cup of tea would go down rather well about now. I thought I would throw in a random picture to liven thing up. It is, after all, Non-Sequitur Thursday. Who doesn’t love Frankenstein’s monster? If it is you, you might like to find another blog to read, because he is one of my favorites and makes frequent appearances in my posts. And I just remembered it is the unofficial start of the Christmas season (but let us not embark upon a discussion how early that stuff goes up in stores. Not on my birthday, at least). 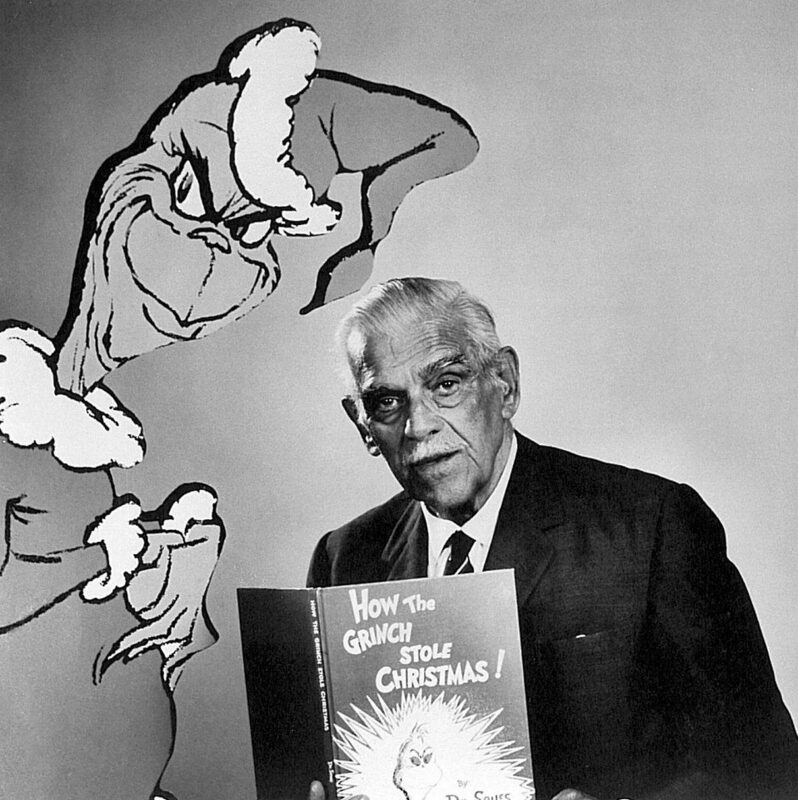 I ADORE Boris Karloff. 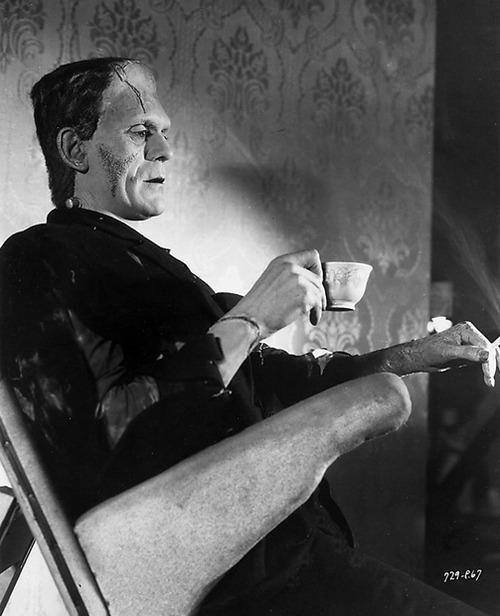 I like Frankenstein and Bride of Frankenstein, but I greatly prefer to hear Karloff’s real voice. So soothing! So mellifluous! I wonder if I can talk Steven into watching Bedlam or Island of the Dead tonight (just to mention the first two that occur to me that I know we have). I wore the tiara for a good portion of today. Getting back to the non-sequitur portion of the day, I include this picture that Steven shared to Facebook this morning. I do not publish my birth date on my Facebook page, but my dear husband will not allow me to fly under the radar thusly. He posted a status wishing me happy then later shared this picture with more well wishes. I was not especially upset, because one could do a lot worse than get a bunch of well wishes one was not expecting. Dare I say I am thankful for all the love? In any case, Happy Thanksgiving, Happy Thursday, and thank you for tuning in. Now I have some Boris Karloff movies (or something) to watch. Posted in humor, Non Sequitur Thursday, personal and tagged Bedlam, birthday, blog post, blogging, Boris Karloff, Bride of Frankenstein, Frankenstein, Frankenstein's monster, Isle of the Dead, Thanksgiving. Bookmark the permalink. It has become something of a routine with me to have Sunday Cinema. I just love to knit or crochet and watch movies on a Sunday. Why not make a blog post with movie pictures as well? Of course we are watching Halloween movies right now (but you know I love to watch Halloween movies all year ’round). Additionally, we saw on Facebook that it is Elsa Lanchester’s birthday today. Accordingly, we started with Bride of Frankenstein (1935). My favorite part of the move is the introduction, with Lord Byron, Percy Shelley,and his wife, Mary, who, of course, wrote Frankenstein. In the movie, the events that follow are not in her original tale, but in parts of The Bride of Frankenstein are in the book Frankenstein. I must re-read that book. So may books, so little time. 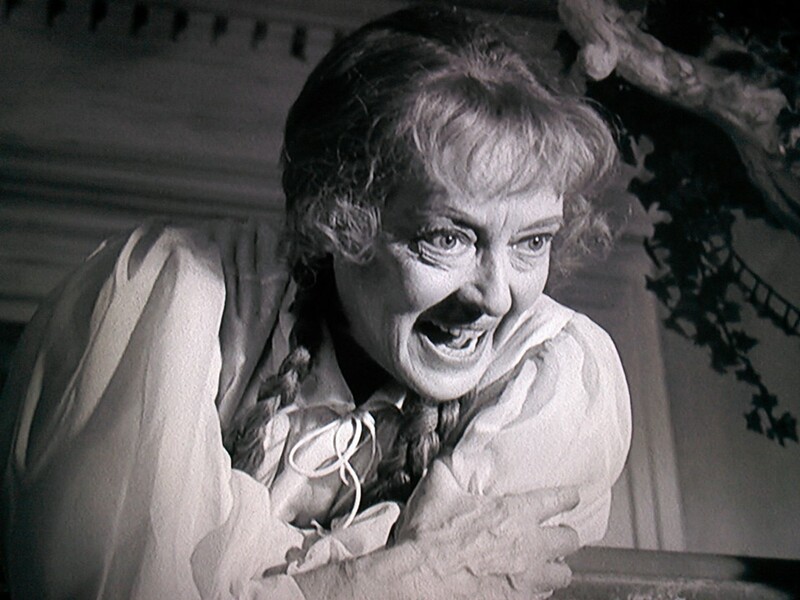 After that fun movie, Steven suggested one I have been in the mood to watch for a while now, Hush… Hush, Sweet Charlotte (1964) with the divine Bette Davis. It also features a wonderful Agnes Moorehead, the bitchy Olivia DeHavilland and another favorite, Cecil Kellaway. Oh, now I fell badly for not mentioning Mary Astor and Joseph Cotten. 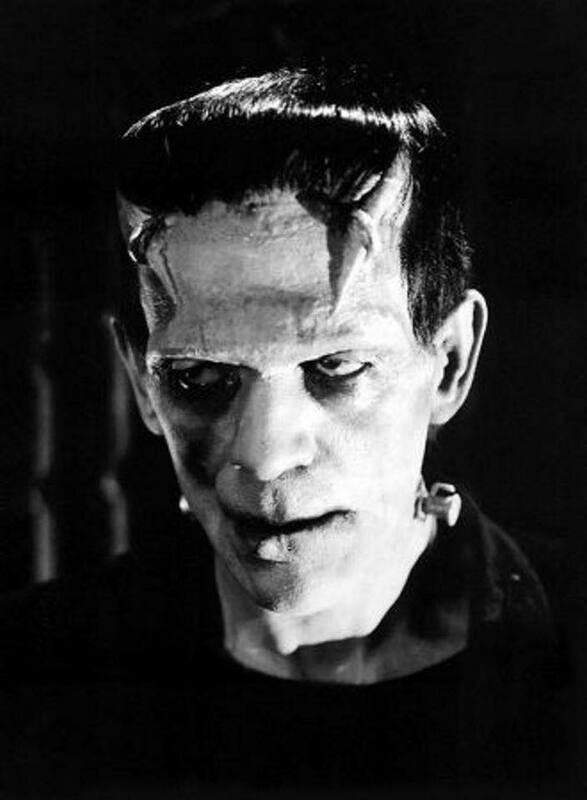 Now I’m thinking I did not even talk about the magnificent Boris Karloff in Bride of Frankenstein. Well, I can’t mention everybody all the time. Bette Davis. Who else do you need in a movie? After Charlotte, I suggested one of our cheesy movies, because those are often shorter. We love Hush… Hush, Sweet Charlotte, but it is a long movie, which is kind of a detriment on a day when I like to watch multiple flicks. 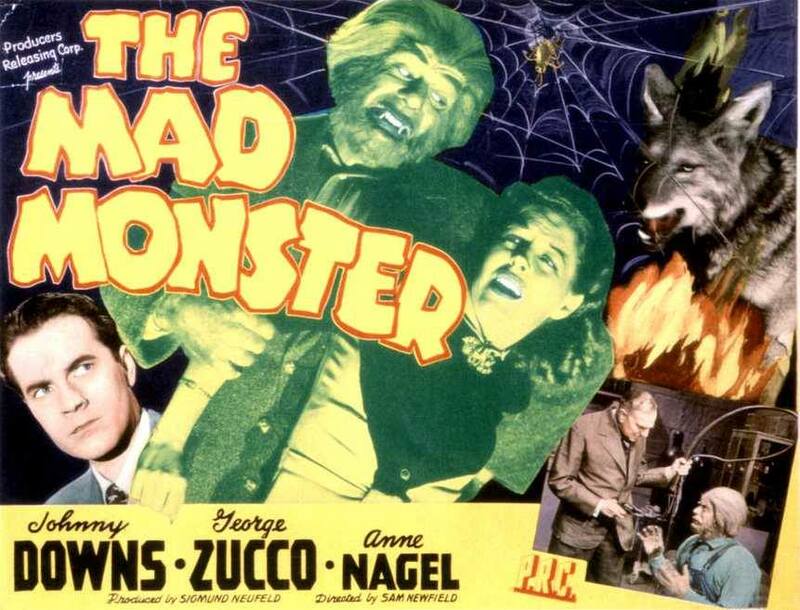 I read off titles on our DVD collection, 50 Horror Classics till Steven said, “Let’s watch that one.” It was The Mad Monster, with the marvelously theatrical George Zucco (I quote the booklet that came with the collection). I just didn’t want the wolf to come to a bad end. Full disclosure: I missed part of the movie while I went into the kitchen to make my salad for the upcoming week’s lunches. Sometime the worst thing about Sunday is that tomorrow’s Monday. However, I shall not repine. I have finished my blog post and there is still time to watch another movie. I hope your weekend was grand. Posted in humor, personal, Sunday Cinema and tagged Bette Davis, blog post, blogging, Bride of Frankenstein, cheesy horror movies, Elsa Lanchester, entertainment, George Zucco, Halloween movies, hush hush sweet charlotte, movies, The Mad Monster. Bookmark the permalink. This is not the picture I used for my profile, but I love the saying. Can I just say, sometimes it is difficult to find the picture you want. Oh, quit playing that miniature violin! Everybody is allowed to complain once in a while. Perhaps I take a few extra turns. These things happen. To continue my post, I went to my Media Library and added the next picture that caught my eye. Some of the older movies made excellent use of shadows. And it just occurs to me: lots of people are scared of the dark, but when it is pitch black, at least you can’t see any frightening shadows. I’m just saying. 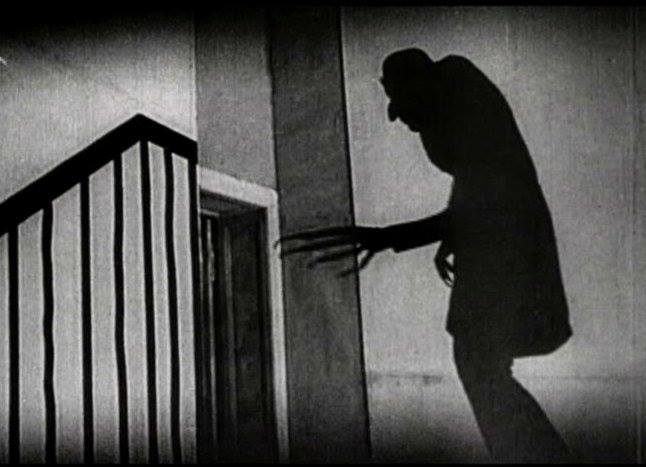 Another observation: I seem to have a lot of pictures of Nosferatu. Some of you already knew that about me. I see by my word count I am over 200 words. Miller time! Figuratively speaking, of course. I am actually sipping seltzer with lemon and feeling fairly virtuous about it. Will my virtue last? A little suspense adds interest to my evening. Happy Monday, everyone. 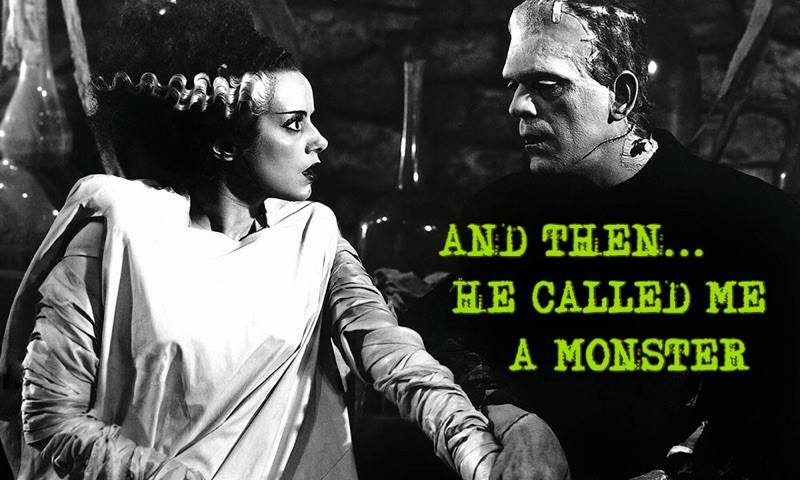 Posted in humor, Monstrous Monday, personal and tagged blog post, blogging, Bride of Frankenstein, Media Library, monsters, Nosferatu. Bookmark the permalink. I am watching The Bride of Frankenstein, looking for a little cinematic comfort food. Regular readers know how I love old time movie monsters. When I went to New Hartford (NY) this afternoon, I rather thought I would make a couple of interesting stops and mention them in a blog post. Instead I got back-ended and drove straight home. I wasn’t going to mention that, but I thought it would be unbearably coy of me to say I was shaken and feeling fragile without explaining why. I’m quite all right, of course. It’s just that I’m such a big fat baby about such things. The point is, I came home and after a couple of long phone calls with insurance companies, I read an Agatha Christie book (also comforting) and looked for one of my favorite movies to try to even myself out. Which does not make for the most scintillating of blog posts, but you’ll have that, especially with me. Eventually I got so cold, I made myself some soup, which I ate with a Heidelberg roll left over from Christmas dinner. Yum. Doesn’t she look classy? I really must take up embroidery again. I had it in mind to watch Bride of Frankenstein a few days ago, because it was Elsa Lanchester’s birthday. I adore Elsa Lanchester. I think she has a better part in Witness for the Prosecution, but we saw that more recently, and anyways, there are no monsters in it. I really felt I must have monsters. I may not be this good-looking, but the description is dead on. I close with a picture I quite identify with. 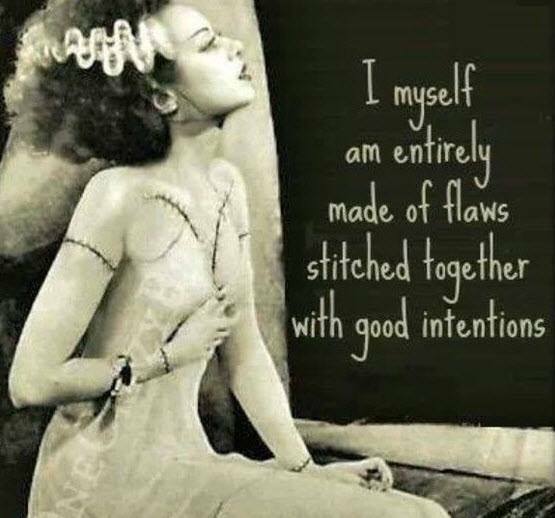 “I myself am entirely made of flaws stitched together with good intentions.” I am going to declare this a Non-Sequitur Thursday and drive on. Posted in humor, Non Sequitur Thursday, personal and tagged blog post, Bride of Frankenstein, comfort food, Elsa Lanchester, feeling fragile, monsters, movie monsters. Bookmark the permalink.